There comes a point in every woodworkers life when they need to install a set of high quality brass hinges in a beautiful one of a kind keepsake box. The thought alone is enough for most of them to quit before even getting started. If you consider all the possible things that can go wrong, you can begin to realize why its such a daunting proposition for even the most experienced makers. But, never fear, help is here! With this method you can easily place, mark, mortise, and fit box hinges quickly and precisely. Follow along and use this guide to get past your fear of installing hinges in your next project. A perfectly fit hinge is the hallmark of a true craftsman. Locate where you want your hinges to be. Determine how far in from the edge, and how much of the hinge needs to be installed. 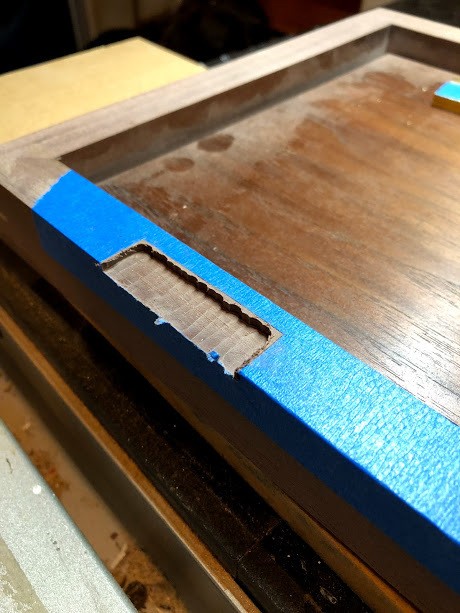 In my case, the hinges are 3” in from the ends of the box, and I want to mortise in only the leaf of the hinge (I’m using Brusso stop hinges that require the barrel of the hinge to be exposed to allow the stop function to work). After you have determined the location, apply a strip of painters tape over that location. Also, apply double sided tape to ONLY the portion of the hinge that is to be mortised in. Painters tape provides the backdrop for the hinge location. Double sided tape applied to only the portion of hinge to be mortised in the box. Now that you know where the hinge will be placed, take the hinge and carefully stick it in place with the double sided tape. You should now have a properly located hinge that is fixed in position and ready to be marked. Hinges ready for precise layout. Using a sharp marking knife, not a pencil, carefully mark around the outside of your hinges. The double sided tape allows you to only worry about marking the hinge and not have to hold in place while doing it. Be sure to take light passes and to cut through the painters tape. 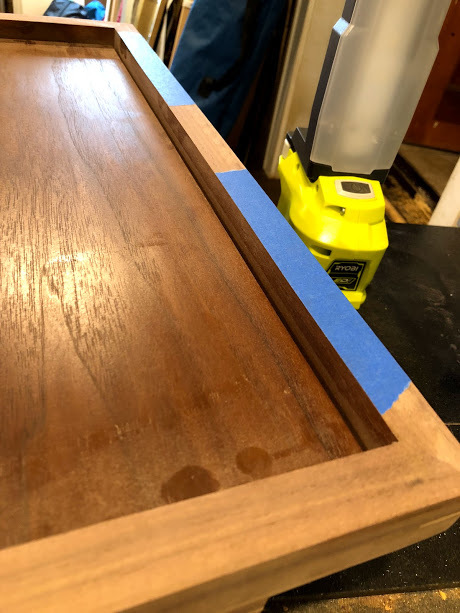 Now, remove the hinge and the double sided tape on the hinge will pull off the painters tape you just cut, leaving you a perfect visual guide to the hinge location. Now you can see exactly where to cut! Make the cut! This can be done a variety of ways, here’s what I did. I got out my Makita cordless trim router with a 1/4” straight bit and set the depth of the bit using the actual hinge as a reference. Then, very carefully, with lots of light and proper dust collection, I routed out the mortise going as close but NOT up to the layout lines. Post routing. Note: do not go all the way up to the layout lines. Leave room for your chisel. Now, using a sharp chisel, clean up the mortise and fit the hinge. At this point the hinge will probably a little snug, keep taking small passes with the chisel and aim for a tight fit with no gaps. Once you are happy with the fit, remove the painters tape and admire your work!! Chiseled out and fit to perfection.